I have a kitchen full of cookery books and yet I'll admit that I've struggled for many years to find an Italian cook book which I actually want to go back to regularly. I love Italian food - one of the things I love about Italian cookery is the tasty simplicity and the great, great ingredients and many cook books are trying to add something innovative or fancy on top of this. Let's Cook Italian from Quarry Books is different. It's not a fancy cook book, its just a collection of simple hearty Italian recipes that were collected by the author, Anna Prandoni, to share with her family. The book is specially designed to encourage children to try to cook and eat Italian food and most of the recipes feature a tip at the side of the page about which part of the cooking or eating your children are most likely to want to get involved in. I'm always a little concerned about a cookbook without photos, especially when it comes to trying to encourage Lara and Holly to get cooking but the lack of photography didn't seem to put Lara off. As soon as we received our copy of Let's Cook Italian, Lara started to browse. At first she was most interested in the fact that each page (including all of the recipes, introduction and chapter overviews) is printed once in English, and once in Italian. This really helps you get into the Italian mood before you start cooking! Lara was really inspired. I've never seen her sit down and read a cookbook from cover to cover before. Totally unprompted she picked out two recipes and asked me if we could buy the ingredients. Of course we could! So tonight Lara cooked dinner for us all - recipes she had chosen from this Family Italian Cookbook. She chose to cook us potato gnocchi which we topped with a Genovese pesto. 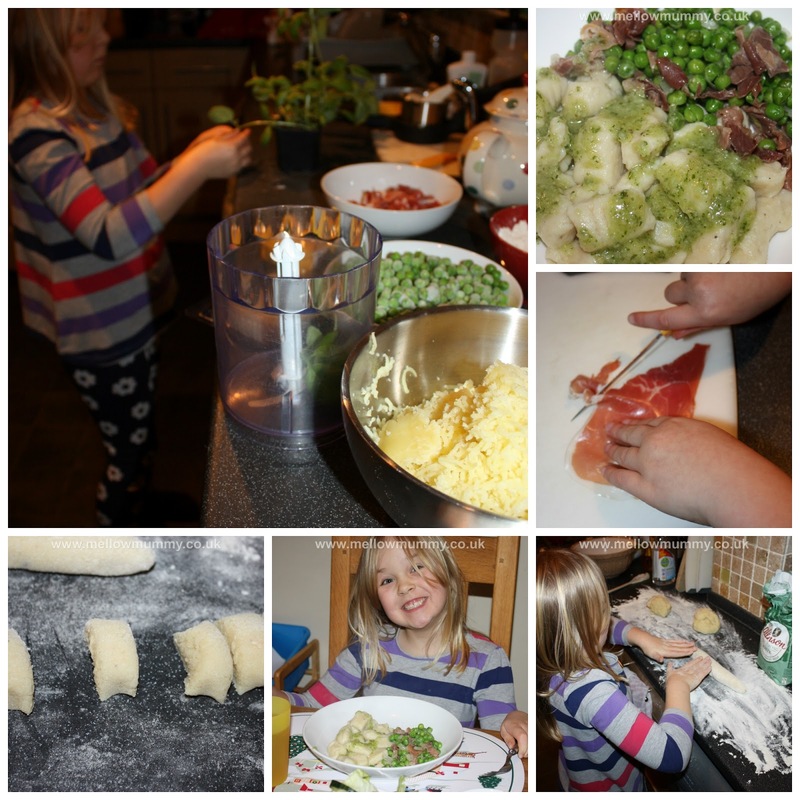 She particularly wanted to serve the gnocchi with a dish of peas with Italian ham (Piselli al prosciutto). Two very grown up dishes indeed. Lara had great fun in the kitchen. Yes, I'm always there to supervise and to provide help when she needs me but now that she can read the recipes and understand the measurements on the kitchen scales, Lara is very independent in the kitchen. Lara loved making the potato dough for the gnocchi - she cut them all, shaped them and then we cooked them in boiling water. Over the top she drizzled a really tasty pesto that she made from basil, pine nuts, hard italian cheese and olive oil. It was properly scrummy. Let's Cook Italian has a good selection of Italian staples such as pizza, spaghetti carbonara, meatballs and tiramisu. There are also a few very traditional italian dishes with which you may not be so familiar. All of the recipes are short and easy to follow which is great for when I'm cooking with the girls. I think I've forgiven this book for not having any photos if it can encourage Lara to cook italian food like this.